You’re part of the ARU and Waratahs’ player retention panel. Folau is off contract at the end of this season. Bernard Foley and Michael Hooper are two other big-name off-contract Wallabies you want to re-sign but for now you’ve been given the job to keep Folau in the game. Of course you want you want to keep him – he’s a freak. He’s in the top three players in Australia and perhaps the most marketable. He’s a phenomenal attacking weapon and the kids love him. His manager knows this and will leverage it for all its worth. Folau is still only 28, he hasn’t had any major recent injuries to worry about, he’s being chased by NRL clubs, and there’s a Rugby World Cup next year. But it’s the positional element that’s complicating matters. You see, he’s just played his first game on the wing in five years, and he was brilliant. 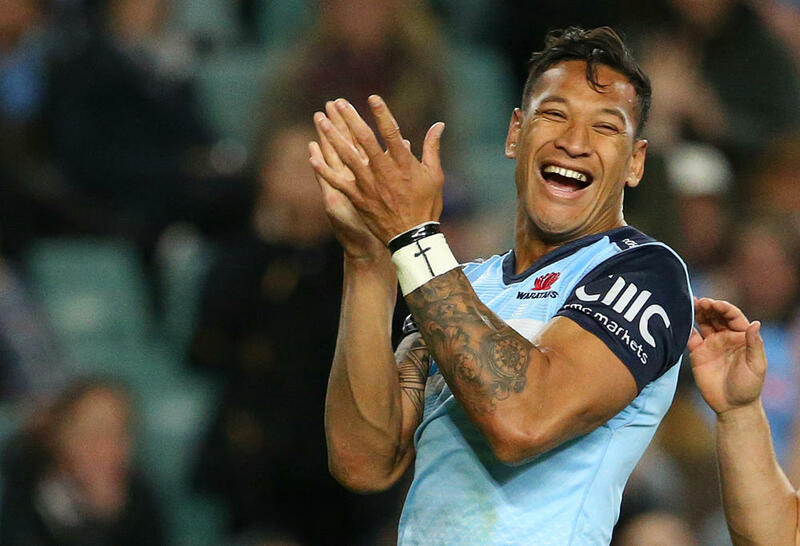 In NSW’s last game a fortnight ago against the Melbourne Rebels, Folau didn’t score a try in the 51-27 rout but he was instrumental in at least three. It was his aerial dexterity – as Gordon Bray would call it – that sparked the second-half surge. Wallabies coach Michael Cheika will be an intrigued onlooker if he keeps plucking high balls from the wing. Even if they don’t go to the air to hit Folau, he at least drags defenders wider that then opens up space in the midfield. He’s been picked again on the wing for the Tahs’ big derby clash against the Brumbies in Canberra on Saturday night. But is he happy on the ding-a-ling? He’s often said publicly that his favourite position is fullback. So given his immense value to the Waratahs and Wallabies, it’s entirely legitimate to ponder the scenario in which Folau and his manager insist he gets the No.15 jersey. Or he walks. How far would you be willing to go to keep him happy? Do you bow to his demand? Who holds the power? With the NRL’s new and improved salary cap, Folau could probably get at least $800,000 a season to switch codes. The Gold Coast Titans are one club rumoured to be moving in on him with a big offer. Losing Folau a year out from a World Cup would be a PR disaster for Rugby Australia, especially if Raelene Castle can’t get the deal done in her first year as chief executive. 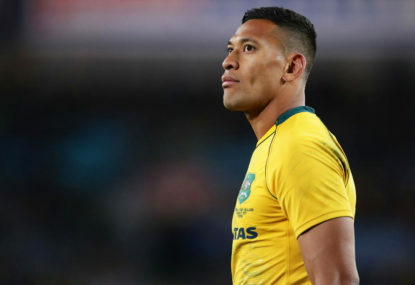 Or do the Tahs and RA have enough swagger to believe that Folau wants to stay, the lure of another World Cup is precious and they’ve got the depth to cover if he quits the Wallabies? Dane Haylett-Petty is a quality fullback and it can be argued that Kurtley Beale is best bringing the ball back in the No.15 jersey. Reece Hodge is another solid fullback option. Or does it even matter? With good coaching, the positions are arguably interchangeable and it may not matter if Folau has No.14 or No.15 on his jersey. He might set up on the wing in attack depending on where they are on the field, but drop back to fullback in defence. Perhaps moving Folau to the wing was a power play by the Waratahs. Bryce Hegarty is going well at fullback, but the timing is surprising. Why has it taken this long to move Folau away from fullback? Remember that incredible leap by Folau in the 2008 State of Origin game when he hurdled over the top of Anthony Quinn for a Queensland try? A few of Folau’s takes against the Rebels proved he’s still incredibly potent in the air, although it only takes a few inaccurate Foley kicks to make the tactic look too high risk and foolish. It’s probably too early to make a call, but maybe Folau has played his last game at fullback. But if he wants to return to fullback, and with a World Cup on the horizon, is his wish granted?